Positivists prefer quantitative methods such as social surveys, structured questionnaires and official statistics because these have good reliability and representativeness. Positivists see society as shaping the individual and believe that ‘social facts’ shape individual action. 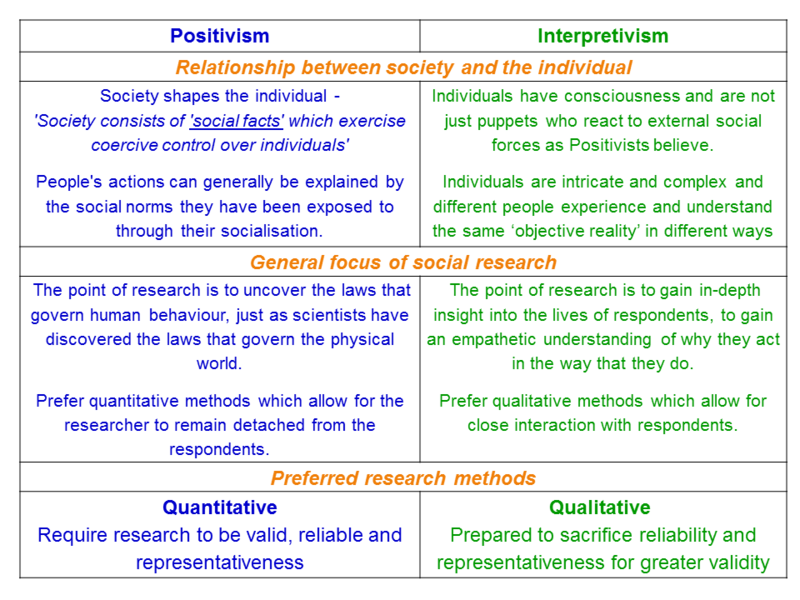 The positivist tradition stresses the importance of doing quantitative research such as large scale surveys in order to get an overview of society as a whole and to uncover social trends, such as the relationship between educational achievement and social class. This type of sociology is more interested in trends and patterns rather than individuals. Positivists also believe that sociology can and should use the same methods and approaches to study the social world that “natural” sciences such as biology and physics use to investigate the physical world. By adopting “scientific” techniques sociologists should be able, eventually, to uncover the laws that govern societies just as scientists have discovered the laws that govern the physical world. Interpretivists, or anti-positivists argue that individuals are not just puppets who react to external social forces as Positivists believe. According to Interpretivists individuals are intricate and complex and different people experience and understand the same ‘objective reality’ in very different ways and have their own, often very different, reasons for acting in the world, thus scientific methods are not appropriate. Intereptivists actually criticise ‘scientific sociology’ (Positivism) because many of the statistics it relies on are themselves socially constructed. Interpretivists argue that in order to understand human action we need to achieve ‘Verstehen‘, or empathetic understanding – we need to see the world through the eyes of the actors doing the acting. Links to all of my research methods posts can be found at my main research methods page.